If you no longer need a Campaign in your account, you can delete it from the Campaigns page. 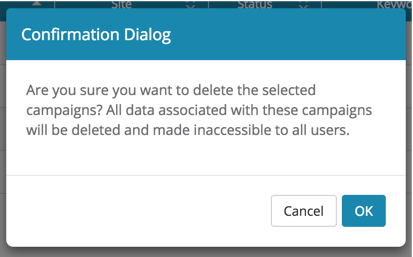 Please note that deleting a Campaign will permanently delete all Campaign data, and there is no undo for this action. If you think you may want to access this data again at some point, it may be a better idea to pause the Campaign instead. 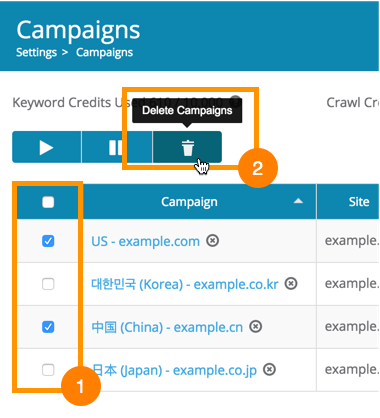 To delete a Campaign, first navigate to the Campaigns page in the Settings menu in the upper-right part of the screen. The Campaigns have now been deleted from the account.